Strap in for a breathtaking, tyre-peeling, high-octane adventure ride by the rising star of action thrillers. Lyon, France: Interpol are convinced the criminals are somehow connected to Formula One. And they think this Australian ex-race driver is just the guy to stop them. thieves they soon expose a far more sinister threat. must drive like never before to stop the worst act of terror since 9/11. When the author contacted me about reviewing this title he didn’t know that I am an addicted Formula One couch potato. 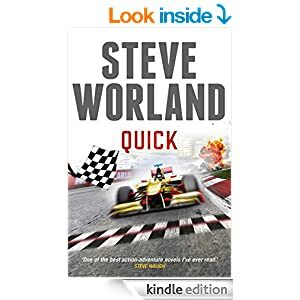 I was interested to see what sort of crime fiction novel you could set in the Formula One world. The answer is a fast-paced sizzling thriller, with lots of mind blowing stunts, and a seemingly indestructible and multi-talented protagonist. I guess being familiar with the names of drivers, the location of tracks etc. really fuelled my enjoyment but I also enjoyed seeing the F1 world from the inside, and I learnt a few things too. The novel really zips along and stretches the bounds of credibility. But who cares? The pure escapism had me snickering at times. And there’s mystery too as you try to work the identity of the Three Champions that Billy Hotchkiss is tracking, as well as what they will ultimately aim to do, and why they are doing it. Steve also wrote the action-comedy telemovie ‘Hard Knox’, the bible and episodes of the television series ‘Big Sky’ and the Saturn award-winning ‘Farscape’. The family film ‘Paper Planes’, which he co-wrote, will be released worldwide in 2015. His novelisation of the screenplay will be released at the same time. He is the author of the action-adventure novels ‘Velocity’, ‘Combustion’ and ‘Quick’ and is currently writing his fourth book. Greg Barron’s SAVAGE TIDE is the follow up to ROTTEN GODS and once again pits intelligence officer Marika Hartmann and friends against a particularly nasty breed of evil-doers bent on causing the collapse of civilisation. It opens with a confrontingly realistic massacre of a group of school children and their teachers in eastern Africa. The people responsible for this atrocity are led by one of the world’s most wanted terrorists. And this incident is only the beginning of what he has planned. Marika works for the squirreliest arm of Britain’s Secret Service and along with ex-Special Forces operative PJ Johnson and a small team they cross some of the hottest spots in the world today a they try to get ahead of the terrorists. Who make the job even harder by having a well-placed operatives in unexpected quarters including near the centre of operations at Marika’s home base. Barron make this more than the standard thriller on two levels. He offers intelligent insights into the mass of complexity that is modern international relations and includes some fantastically memorable characters. Like Kifimbo, a soldier and Marika’s local guide in Somalia, who is haunted by the things he has seen and becomes attached to the infant survivor of the massacre he witnesses. And Ayanna, the Somali village girl who dreams of a different life than the one she is destined for. Even the bad guys are fleshed out so that readers understand what motivates their actions even when we find them abhorrent. As with the first book I did find SAVAGE TIDE a bit long, too densely detailed at some points, but it seemed to move at a quicker pace and I was compelled to keep reading. The short chapters, each showing action from London to Iran to Somalia and a half-dozen other places besides, help provide the sense of speed the novel offers. It’s always a good sign that a book will leave a lasting impression when, days later, I am still wondering how a character is coping with the injuries they incurred. I hope there’ll be a third novel in the series so I can find out. COMBUSTION is also a second novel in a series and though in this instance I haven’t read the first Worland provided enough information about events that unfurled there for me not to feel left out (yet not too much that I feel I couldn’t go back and read the first). An alleged environmentalist with more money than sense unleashes his horrific plan to ensure people finally stop relying on fossil fuel-burning engines on the freeways of Los Angeles and it falls to NASA astronaut Judd Bell and his Australian, helicopter-pilot friend Corey Purchase to stop the mayhem. Worland makes no secret of the fact his background is in movies, in fact his website’s claim is that his books offer the best action movie you’ll ever read. There are some up-sides to this background – the action is full on and there isn’t a lot of unnecessary filler – though overall this style of book is not really my cup of tea. I have been known to skim-read the action passages in thrillers (fight sequences and descriptions of equipment and weaponry being among my least favourite subjects to read) but in this instance doing so wouldn’t leave a lot else behind. We do get a bit of a back story to Judd and Corey but there’s really sod all to explain how the madman at the centre of the evil plot got to the point where he could internalise the hypocrisy of claiming to be an environmentalist while plotting to kill millions and ruin the west coast of America for a decade or so. But the action is made enjoyable by the vein of humour, depicted most notably in the easy banter between Judd and Corey and the unique relationship between Corey and his faithful dog Spike. I do have to have a tiny whine about two elements of the writing though. By the end of the novel I was gritting my teeth at the constant brand name dropping as characters glanced at their Tag Heuers, reached for their iPhones (no Android devices in the whole of LA apparently), leapt into their Priuses (Priusi?) and otherwise acted like shills for the hippest of (presumably deep-pocketed) companies. And while I know this is going to highlight my status as a grumpy old woman (as if I’ve been keeping that a secret) I’d also had enough of gratuitous italicisation. As in “…the rubble is right at his heels…” and “…seems to gather speed…”. Why? Of course discussing books together like this almost demands comparison, however unreasonable that may be, and as I did read the books in close succession I did compare them naturally anyway. For my taste SAVAGE TIDE is the preferable novel because I like subtext and learning what makes people tick more than I like the adrenalin-rush action of things blowing up and in-the-nick-of-time escapes (though SAVAGE TIDE has those elements too). But COMBUSTION is a lot of fun and, if they get the casting right keep their tongues firmly planted in their cheeks, will make a romp of an action movie.